Until recently, Floridians could count on a daily drenching sometime in the afternoon—except during a few cool, dry winter months. Long-time Florida residents note that those predictable daily storms are fewer in number and lighter in intensity. And they tend to be random rather than predictable. Climate change is increasingly affecting weather on a local level, so much so that the U.S. Department of Agriculture recently changed the plant hardiness zones for the entire country. Atmospheric conditions, fossil fuel emissions, warming ocean temperatures and local land use may be behind the vanishing afternoon summer showers. However, it is more serious than a lack of afternoon drenching. Climate-related concerns for Florida include extreme weather, saltwater intrusion into private and public water supplies, adverse effects for agriculture and sea level rise. Climate change is often difficult for non-scientists to wrap their head around. The changes in weather patterns and climate are not measured in seasons or years, but by long-term trends over decades and centuries. The changes experts are predicting for the Southeast won’t happen next year, but will unfold slowly over the century. Those who pay attention to climate issues, or even just the local weather broadcast, have no doubt become familiar with El Niño and La Niña. El Niño arises from warmer Pacific Ocean currents, and the southeastern United States experiences cooler but wetter winters. La Niña becomes dominant when Pacific Ocean temperatures are cooler, and the Southeast typically has warmer and drier winters—often with 50 to 60 percent less rainfall. El Niño and La Niña—and dozens of other climate-related ocean oscillations—are used in global climate models (called GCMs) to help project future trends. Unfortunately, at regional and local levels the GCMs are less accurate, said Vasubandhu Misra, Ph.D., assistant professor at Florida State University and member of the Florida Climate Institute. Less accurate local predictions are the result of statistical constructs and magnitude. “If you look out your window, the largest cloud you might see is a kilometer. The resolution of our climate models are on the order of 100 kilometers or even closer to 200 kilometers,” Misra said. “The rain in a model is an aggregate—a virtual cloud,” Misra said. The models are not designed to simulate the difference between Miami and Fort Lauderdale, said Katherine Hayhoe, Ph.D., climatologist at Texas Technical University at a 2011 climate seminar at the University of Florida. “The biggest model disagreements over the Southeast come in the summer,” she said. To understand the impact on Florida, models must be downscaled, which has proven difficult. Clouds are major components of climate predictions because they affect both radiation and absorption of heat—but they are variable and chaotic and have proved problematic for global climate modelers. Nevertheless, climatologists wrestle what data they have into coherent local predictions, which for Florida points to less rain in the summer and slightly more in the winter. The drying conditions are dependent on geographic location and season—dry winters in the Panhandle area, dry spring weather statewide, less dry north Florida summers but the possibility of severe drought in South Florida. Decrease in rainfall statewide is expected in all seasons except for the fall. Florida is unique when it comes to global averages. The peninsula state is at the same latitude as the great deserts of the world. Orlando, for instance, is practically in line with Cairo, Egypt, according to Misra. So how did “La Florida” the land of flowers, get its name if it sits on the northern hemisphere’s desert belt? Water surrounding the long peninsula gives Florida distinctive climate conditions, he said. However, with less rainfall and continued loss of naturally occurring wetlands, Florida’s future as lush, subtropical paradise may be threatened. Florida’s climate is greatly affected by the loss of wetlands to development and agriculture. From 1780 to the 1980s Florida lost 46 percent of its original 20.3 million acres of wetlands, according to a 1990 National Wetlands Survey compiled by the U.S. Fish and Wildlife Service. Current wetland acreage is calculated about 9.3 million, according to the Florida Division of Environmental Assessment and Restoration. Although, at 55 inches a year, Florida has had the second highest annual rainfall in the country, there has been significant decrease in rainfall. And it is likely connected as much to climate as to land use. Wetlands have been the natural storage area for tremendous amounts of rainfall during Florida’s summer. These wetlands are the staging ground for more rain—the natural cycle of rainfall, heat and evaporation is what produces those predictable afternoon rain storms. Nearly 90 percent of Floridians get drinking water from the Floridan aquifer, a huge natural storage tank that stretches from Florida to South Carolina and west to Alabama and even part of Mississippi. Although a small percentage of Floridians get water from other sources, the Floridan aquifer is the mother lode of the state’s water supply, and, because it spans the Southeast, that of other states as well. Recharging the water in the underground system is a time-intensive process that requires a lot of water—from regular and consistent rain, as well as huge tropical storm systems. The water must percolate hundreds, often thousands of feet, through soil, gravel and a labyrinth of porous limestone before settling down on top of a layer of saltwater in the aquifer. In peninsular Florida, the water percolates into the aquifer at about 1 to 5 inches per year. The five water management districts in Florida have issued warnings that conservation of water resources in the light of drier climate predictions may become a way of life for Floridians. Less precipitation, more population, and climate change coalesce to stress Florida’s underground water resources at a rate that alarms some residents and government leaders as well as agricultural concerns and public and private utilities. Coalitions and organizations are emerging all over the state to address these issues. All Florida’s water management districts have some kind of information about the effects of climate change on water resources. “We need to look out 20 to 30 years and be sure that we can meet the needs of water suppliers, utilities, agriculture, public supply and ecosystems” said Tom Bartols, director of the Bureau of Water Supply for the St. Johns River Water Management District. Bartols is one of the authors of the district’s recently released Water Supply Impact Study in which population, land use, and climate change are explored as threats to Florida’s water resources. The Public Water Supply Utilities Climate Impact Working Group was formed about two years ago when a utility approached the UF Water Institute looking to bring together stakeholders around water issues in Florida. The institute and the Southeast Climate Consortium convene workshops for public water suppliers, water resource managers, climate scientists and hydrologic scientists to share knowledge, data, models and decision-making strategies for the future of Florida’s water. In February 2012 several north Florida counties united to form FLOW, Florida Leaders Organized for Water to protect the areas groundwater resources from being usurped by localities elsewhere in Florida. The Southeast Florida Regional Climate Change Compact is a coalition of Broward, Miami-Dade, Palm Beach and Monroe counties to work together to mitigate and adapt to climate change, which includes addressing water issues. There are also citizen organizations such as the Clean Water Network, Florida Defenders of the Environment, and dozens of others forming around specific community water resources such as lakes, rivers, and springs. Hurricanes have been a significant source of recharge for the Floridan aquifer as well as filling lakes, streams and Florida’s remaining wetlands. Hurricane activity though is one of the least certain predictions of climate models. Hollywood movies would have us believe that hurricanes will increase in intensity and frequency at devastating rates, climate scientists believe that the kind of ground-drenching tropical storms needed to replenish aquifer may not be on the increase. “Some researchers claim that linkages between global warming and hurricane impacts are premature,” climatologist David Zierden told the audience at a March 2012 Public Interest Law Conference at the University of Florida. World hurricane experts predict that the numbers of hurricanes per year will be the same or unchanged—however, intensity may be increased. Although hurricanes may not be on the increase, they may couple with sea level rise to intensify storm surge along Florida coasts. While uncertainty may exist for the amount of increase in ocean heights, sea level rise is undeniably related to climate change, and Florida’s coastal cities are not waiting for any signals from the federal or state governments to address this pressing issue. In 2007, Governor Charlie Crist told the Florida legislature that “global climate change is one of the most important issues that we will face in this century.” He pointed to Florida’s 1200 miles of coastline where a good portion of residents live, and the potential vulnerabilities to rising sea level and extreme weather patterns. Sea level rise is a result of two factors: warming, which increases ocean volume; and the melting of continental ice sheets and glaciers, which add more water to the oceans. Sea level for Florida has declined and increased over hundreds of millions of years depending on global climate conditions. The peninsula has been as small as just a few counties in the northeast to a coastal extension of 150 miles into the Gulf of Mexico about 18,000 years ago when the last glacial period locked up a lot of the water. Prehistoric Florida residents migrated inland when necessary as evidenced by recent finds by archeologists at Florida State University. Artifacts and remnants settlements dated to 8,000 years ago were found in 50 to 60 feet of water near the Big Bend near the Panhandle. 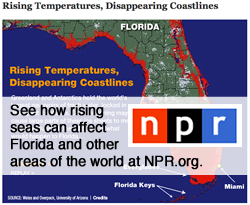 Climate-induced sea level rise will more than likely affect the entire coastline of Florida in one way or another. Modern sea level for Florida has been rising for more than 100 years, according to Zierden. “Data from the Pensacola and Mayport (near Jacksonville) indicates a rise of about 8 to 8.5 inches per century or 2 to 2.5 millimeters per year,” he said. South Florida is among the places to be significantly impacted by sea level rise along with other low-lying coastal areas around the globe including New York City, Pacific islands, parts of Japan, and low-lying areas of southeast Asia. In a report recently released by the Southeast Climate Consortium (SECC), sea level is predicted to rise 80 centimeters by 2100. 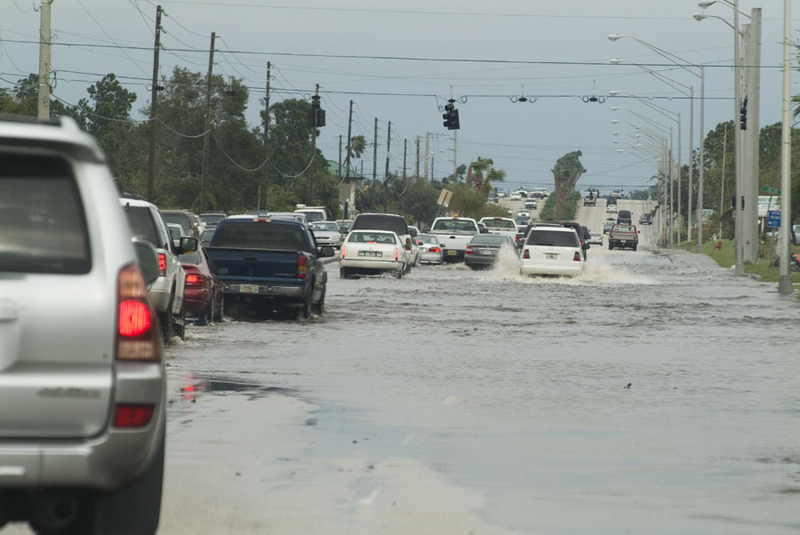 Although uncertainty exists, areas of Florida that are only a few feet above sea level have prudently decided to create strategies for the worst case scenario. Sea level rise has the potential to cause huge amounts of infrastructure damage both in the public and private sector, especially as the 80 centimeter estimate is considered by many to be conservative including tide gauge expert Gary Mitchum at the University of South Florida. Miami-Dade County established a climate change task force in 2006 and Broward County followed in 2008. Broward County is currently meeting with stakeholders to make significant changes in its comprehensive plant to address climate change and sea level rise in particular, according to Nancy Gassman, the county’s natural resources administrator. Both counties have devoted resources to investigation, analysis, planning and community outreach in efforts to mitigate and adapt to the various impacts of climate—including sea level rise. The task force groups are cross disciplinary and include members of the community, government agencies and climate change experts. Under certain conditions, Gassman said, Broward County coastal residents are already getting some experience of sea level rise. From September through November at certain phases of the moon, high tide has been 6 to 10 inches higher than normal. The county has taken steps with changes to infrastructure to mitigate damage from these regular events. However, Gassman, said southeast coastal communities must prepare for more extreme conditions if sea level predictions turn out to be accurate. “Climate change may seem distant, but it is a subtle and creeping change,” Misra said. “When people say ‘this spring is getting to be warmer than the previous year’—they are perceiving climate change.” But in the same breath, “it would be immature to run away with the conclusion that this year’s spring is warmer than the previous year is solely on account of climate change,” he explained. Will the regular afternoon thunderstorms return to Florida? For locally produced rain to increase in Florida, existing wetlands would have to conserved and dried up wetlands would need to be restored. Some effects of climate change, however, might push solutions toward adaptaion. The models point to a drier Florida, and, at least for the short term, fewer hurricanes. Good news if you’re planning a picnic. Not so good for your garden and the future of Florida’s water resources.